Anna Vyakhireva is recognised as one of the biggest handball talents in the world. 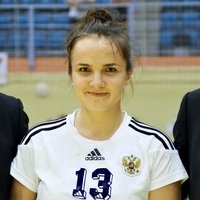 In 2012, the 19-year-old right wing and right back was already part of the Russian youth and junior teams at the world championships in Czech Republic and Montenegro, leading the youth to the silver medal, awarded as Most Valuable Player and being part of the juniors, who finished fifth and she was awarded best right back as part of the All-Star Team. In 2013 she received the Most Valuable Player award again and was the key to Russia’s gold medal-winning team at the Women’s 19 EHF EURO in Denmark and she was awarded best right wing of the Junior World Championship this summer as Russia again missed the gold medal after a final defeat against Korea. Now Anna Vyakhireva is on her way to the women’s team of the four-time world champion. The EHF EURO 2014 will be here her first major event in senior competitions, where the Russian team will face hosts Hungary, Spain and Poland in the tough Group A of the preliminary round in Györ. If Anna will be among those 16 nominated for the EURO, she will join her sister Polina Kuznezcova (27), who has also been nominated for the provisional squad by head coach Jevgenj Trefilov. Since the start of this season, both sisters play for the same club side, Astrakhanochka, after Anna had started her career at Zvezda, where she had her first appearance in the Women’s EHF Champions League at the age of 16. Her first steps in handball came at Lada Togliatti, where her father was also her coach. He had taught the young right hander to switch to her left hand and despite her height of just 162 centimetres Vyakhireva has a huge variety of options and positions she can play. In this interview with eurohandball.com Anna Vyakhireva talks about her career to date and ambitions for the EHF EURO 2014.
ehf-euro.com: When did you start playing handball – and is handball part of your family, as your sister also plays for the Russian national team? Anna Vyakhireva: When I was little, our family moved to Togliatti, the spotlight of Russian women’s handball, we lived near the arena, where my father introduced me to sports, particularly to handball as my older sister Polina was already playing. My father always was my coach, even when I transferred to Zvezda, where he was the assistant coach. ehf-euro.com: Had there been time for other hobbies in your youth, or was handball everything for you? Anna Vyakhireva: I learned to read very early, when I was four years old. So sports and reading were my main hobbies in childhood. ehf-euro.com: What are your strengths, and in which parts of the game you still have to learn? Anna Vyakhireva: Playing in defence is not so easy for me. My height is small, so to stay in a 6-0 defence for me is a problem. I like to play a 4:2 defence system as an advanced player. According to my father, this is most suitable for me. ehf-euro.com: Is there any role model you have in handball? Anna Vyakhireva: There are a lot of good handball players all over the world, and I want to learn from all of them. ehf-euro.com: Russia is always one of the top nations in Younger Age Categories of women’s handball – why? Anna Vyakhireva: I think, perhaps we have good schools for young female handball players. The other question is why our women’s team didn’t play so well in the last years. ehf-euro.com: EHF EURO 2014 will be your first major event in the women’s team. Do you feel a certain pressure and what role do you think you will have in the team? Anna Vyakhireva: First, I must get a spot among those 16 players to be nominated for the EHF EURO. And pressure? For me is not a problem, I can control it. I think others should rate my role and talk about me. ehf-euro.com: If you had a choice, would you prefer to play as right back or as right wing? Anna Vyakhireva: Sincerely, I prefer to play as a right back because in this position I feel freer in my movement. ehf-euro.com: The face of the Russian team changed a lot – is it easier for younger players to jump in? Anna Vyakhireva: Indeed, the EHF EURO 2014 gives a really good possibility for young players to be part of the Russian team. After missing out on the 2013 World Championship it is important to turn things around and restore the prestige of Russian women’s team. ehf-euro.com: Since the World Championship title in 2009, Russia missed the semi-finals of all major events – can your team make it this time again? Anna Vyakhireva: I do not want to make any predictions. I am just confident that we will do everything that we can and everything that depends on us. We will see what happens. ehf-euro.com: Which teams do you consider as favourites in December? Anna Vyakhireva: Perhaps the favoured teams differ from the previous competitions. Maybe Montenegro, Norway and Hungary have some advantages. In fact, this championship will be very interesting, because at the moment a lot of teams seem to be at the same level. I expect a huge number of close matches with fights until the end. We will try to show good handball and make our fans happy. ehf-euro.com: What are your plans and dreams for the future – in the club and the national team? Anna Vyakhireva: I want to win the Russian championship and a European Cup competition with my club, and I want to go to Rio 2016 to win an Olympic medal.